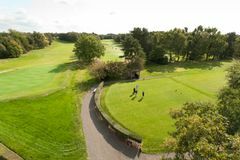 Formed in 1890, York Golf Club is the local area's oldest club and is home to a terrific heathland championship course. The layout was mapped by the great J.H. Taylor, an immortal name in the realms of British golf course design, and is an essential for any visitor to York. The flat heathland course at York Golf Club is now lined by mature woodland, which creates clearly demarcated, demanding holes with a particular emphasis on strong driving. From the tournament tees the course stretches to 6,301 yards; this may not be long by modern standards but there is more than enough complexity to York's layout to make it a stern test of championship golf. The staff were very good and we well received by Clubhouse and Pro Shop. Unfortunately the course was having working done but the Club more than made up for this by giving our team of 8 vouchers to play the course again for free at a later date. Excellent!